This biennial or tender, short lived perennial is endemic (found natively only on Madeira) to the Island of Madeira, which lies 400 km north of the Canary Islands in the Atlantic Ocean. In Victoria, Australia it is considered a “high weed risk.” In California it is declared an invasive species in the Palos Verde Peninsula, San Dimas Canyon in the San Gabriel Mountains, the San Rafael Hills, and at the San Elijo Lagoon. This plant will grow 6 feet tall and at least that large around; it blooms in spring. Beginning in June and continuing until fall, these 20” long flowering racemes are very attractive to butterflies and bees who relish the nectar. This plant is one of the many Viper’s Buglosses around the world. The seeds of E. candicans are known to be very high in gamma-linoleic acid or GLA, which is a very useful and popular health supplement. The leaves of the plants are also used in herbal medicine as infusions to treat headaches, fevers and coughs, as well as for their diuretic properties. 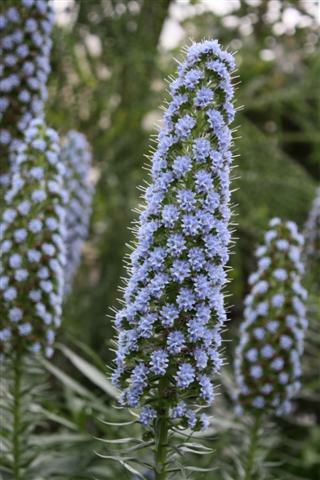 Pride of Madeira may be poisonous if consumed and the plant is covered with bristles which may irritate the skin if the plant is touched No part of the plant is edible. Pride of Madeira may also be toxic to animals and people if the plant is consumed and caution should be taken when handling plants.